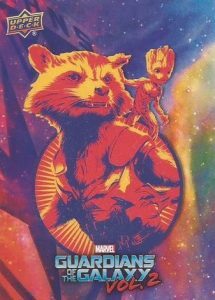 If you need a GotG Vol. 2 collecting fix and simply can't wait to start snagging more Marvel Cinematic Universe cards, the 2017 Upper Deck Guardians of the Galaxy Vol. 2 Promo cards provide an early look. Exclusive to Hanes products at Walmart locations, every pack contains four cards, many of which display a fair amount of color and shine. While there are other UD card sets for the movie, these designs are only found in the promo packs. Along with a moderate base, collectors can find Blue (1:2 packs) and Gold (1:2 packs) foil parallels. The base cards include a #WP prefix in the card numbering with 50 cards in the set. In addition, several different chase inserts combine to average one per pack. This includes Character Die-Cut (#DC) inserts with a distinct shape, the superfractor-esque Chrome Cuts (#CC), and the blinding Silver Comics Characters (#CO). 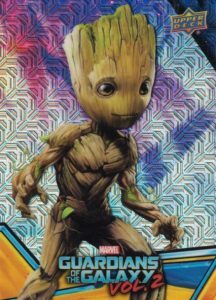 The longer 2017 Upper Deck Guardians of the Galaxy Vol. 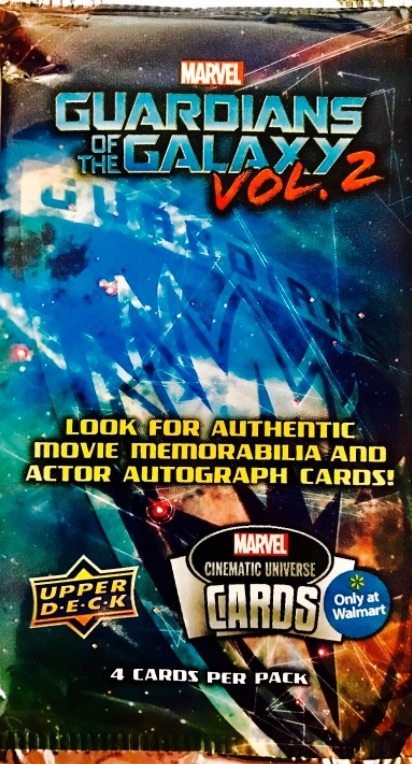 2 Promo odds apply to Dave Bautista Actor Autographs (#/10), Stan Lee Autographs (#/10) and Retro Throwback Memorabilia cards (1:10,000 packs). The packs also contain code cards for Marvel movie rentals on the VUDU platform. 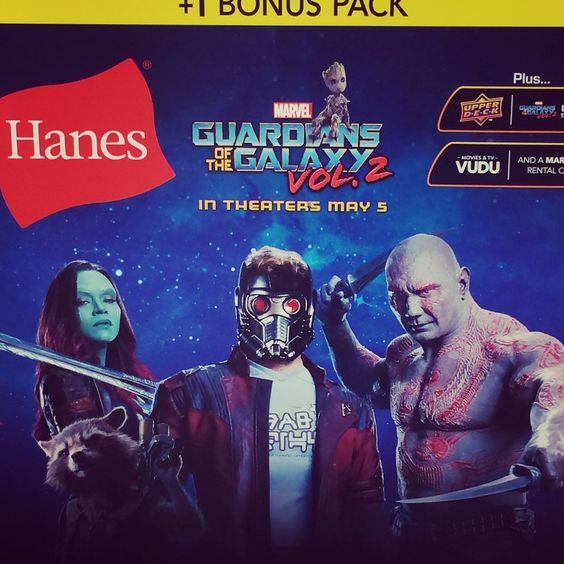 Those looking to obtain the promo cards should check their local Walmart for a Hanes Guardians of the Galaxy Vol. 2 display box. Some locations prominently display them in the aisle while others have them in the standard Hanes section. The promotion includes one Upper Deck pack in select men's undershirts and underwear. Although the cards and packs have a printed date of 2016, they did not start showing up until the end of February 2017. The main Guardians of the Galaxy Vol. 2 card product is out closer to the official movie release date in May. 2017 Upper Deck Guardians of the Galaxy Dave Bautista Karen Gillan Dual Auto ! PARALLEL CARDS: Blue Foil, Red Foil. Bought some men underwear w/Hanes Promo pack of 4. 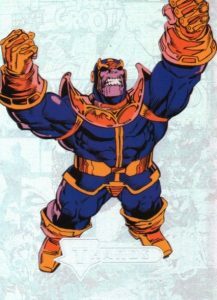 I have CD-9 Thanos, WP-13 Drax, WP-47(foil), and WP-49. People who are interested please make offer. Thank you kindly. 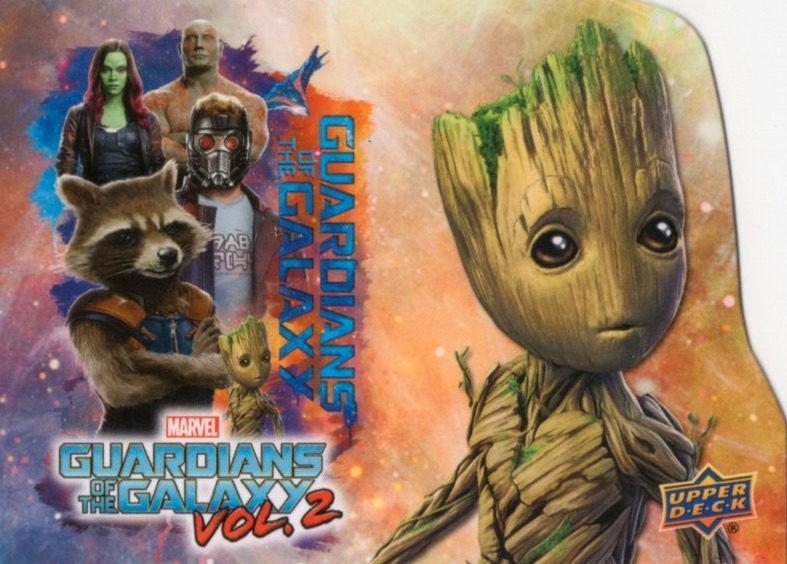 Need GotGv2 singles for set – PLMK what you have to trade or sell. I have the following base set cards: WP-8, 12, 13, 15, 16, 17, 18, 24, 26, 29, 30, 31, 32, 35, 37, 38, 39, 40, 41, 44, 45, 46, 47 and 49. I also have CO-14, CO-15 and CC-3.